PROLine Products LLC was officially founded in November 2002 by Tom Murtagh, but the history of PROLine and our quality aluminum trailers run much deeper than that. Research and development goes back decades for Tom who, as an avid snowmobiler his whole life, got into the trailer industry as he didn’t like what he found on the market. After talking to a lot of manufacturers who wouldn’t give him the time of day, he built a three place snowmobile trailer in his garage. That initial trailer turned out better than expected, but not as good as it could’ve been, and he decided to move forward and start the company that we have grown into today. This “never settle” vision has led us to build the absolute best trailer we can and is why every detail of our trailers is engineered to be not only rugged but as user compatible as possible. You can be assured that every trailer that leaves our facility was built with the customer in mind and with most trailers being custom builds, it’s a very specific customer. In 2007 we decided to forgo the typical trailer sales approach of supplying a dealer network and sell strictly factory direct. This decision has been eye-opening to say the least. In more than a decade since then we’ve seen customer satisfaction go up tremendously. Gone are the days of a potential customer going to a dealer with their needs and the dealer responding with “Sounds like this trailer we have in stock is perfect for you.” Maybe it was, but often it wasn’t. We wanted to create a way for your ideas to be heard and your needs to be met in a seamless fashion. Where buyer and builder come together with their ideas to work towards a more perfect product; to us this meant eliminating the dealer. This has created much more work for us, but it’s work that’s far more enjoyable. We’d rather build trailers for people than for parking lots. With our sales being factory direct, many customers expect our trailers to be less expensive, and to be honest, they are. If you find our trailers expensive, odds are you’re either comparing them to a steel frame trailer (which should be MUCH less expensive) or another aluminum frame trailer without the same great features, parts, and quality construction that we put standard in all of our trailers. 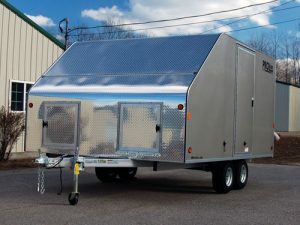 There are a lot of cheap trailers on the market but we don’t have any interest in building one. You’ll find our trailers are priced right in line with other high quality aluminum trailers but often times we’re quite less. And you won’t find the quality in another brand trailer as you will in a PROLine Products LLC trailer. Our pricing boils down to simple economics. The cost of shipping raw materials is a fraction of the cost of shipping an entire enclosed trailers. All PROLine Products trailers are built in and sold from our facility in Milton, New Hampshire. With PROLine you’re buying directly from the manufacturer. You’re not picking up from a dealer who’s trying to profit plus give his salesman commission. We’re cutting out the middle men and passing the savings along to you. By custom building trailers for our customers, we’re able to avoid the high cost of maintaining a huge inventory and you get the trailer with what you want, in the color you want, for the price you deserve. Bottom line is you’re not just getting the best trailer, you’re getting the best value. If you ever see a “similar” trailer for a lesser price, chances are you’re getting MUCH less of a trailer. There are lots of ways to cheapen up a trailer and our competitors have found every single one of them. We don’t want to be in competition for the cheapest trailers, we want to be in competition for the best. This is why we use all quality components. Parts and materials that we have faith in, and by being properly put together they create a strong, long lasting trailer. We manufacture our trailers using checklists and procedures, not with shortcuts and “good enoughs.” The trailers we build are designed to tow straight, not leak, and be as problem-free as possible. Our mistakes are not taken lightly so our new hires are always thoroughly trained in every task that they perform. We employ and maintain a very well trained production team and they know how high the bar is set. PROLine Products LLC is family owned and operated. Calls to our office are answered by a member of the Murtagh family to make sure your questions or concerns are addressed in a timely manner. Too many times we’ve heard of customers who have contacted either their local trailer dealer or other manufacturers with simple questions that were somehow never answered. The dealer sends the customer to the manufacturer, the manufacturer back to the dealer, and that’s if either ever answers the phone. We’ve gotten a lot of business based on our customer service history alone. It shows we care about you, our customers, and we want you leaving our facility not just with one of our trailers, but the right trailer for you. Often our customers are surprised that we didn’t suggest a bigger, more expensive trailer but those trailers don’t always suit the customer’s needs or the needs of their tow vehicle. The best form of advertising for us, or any business, is by creating happy, loyal customers. A process that is automatic when you put out a quality product that exceeds the customer’s expectations, and of course, is offered at a fair price. Since our humble beginnings we’ve had customers come from as far west as Anchorage, Alaska and as far east as Iceland to pick up our trailers. A fact that still blows my mind. We’re looking forward to what the future brings but in the meantime we’ll continue to build the best trailers we can. Thank you for considering PROLine Products for your trailer needs and we look forward to earning your business.